Samsung Heavy Industries Co. is considering adopting a compulsory unpaid leave plan for its employees as it receives fewer orders amid oversupply and lower demand, the company said Sunday. 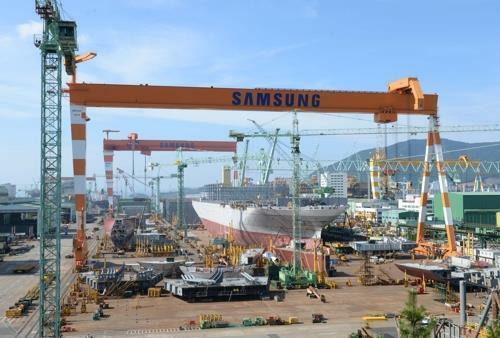 Samsung Heavy's move comes after Hyundai Heavy Industries Co. recently offered an unpaid leave plan to its workers at the country's biggest shipbuilder's offshore plant shipyard, which was temporarily shut down due to a lack of new orders. "Some 3,000 office and yard workers at Samsung Heavy took turns taking paid leave from November to June due to decreasing orders. As its financial status worsens, the company called on its workers to accept an unpaid leave program for survival," a company spokesman said over the phone. The 3,000 Samsung Heavy workers were paid 70-80 percent of their normal salaries under the program, he said.